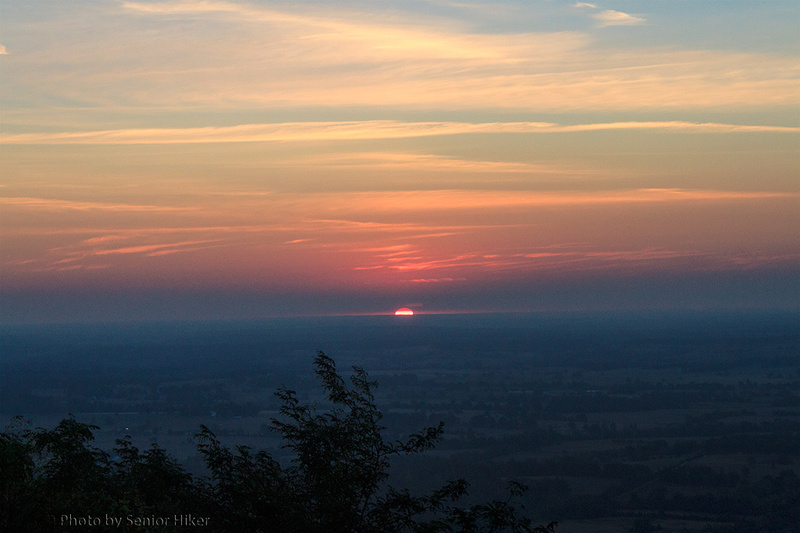 Sunrise from Gaither Mountain, Harrison, Arkansas. August 7, 2012. 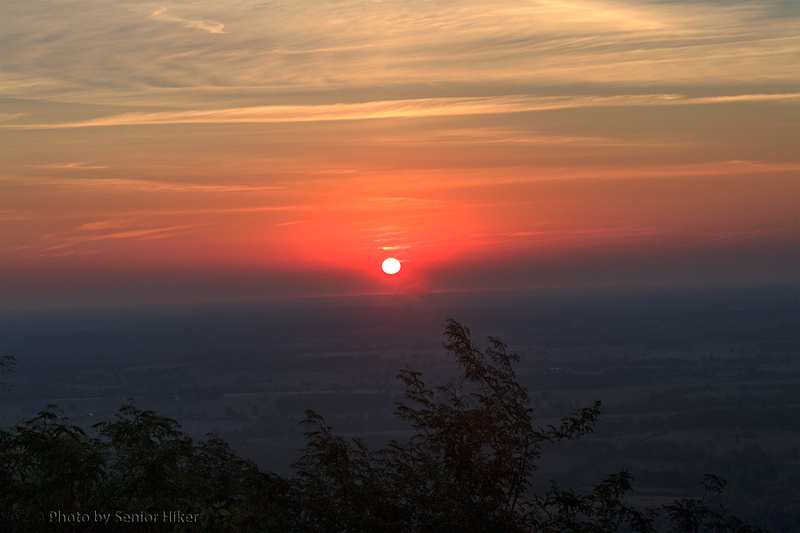 On our last morning in Arkansas Betsy and I got up before dawn to watch the sun rise from Gaither Mountain near Harrison, Arkansas. We had traveled over the mountain the previous day and we knew the view was spectacular. What we didn’t know is that we would be delayed by a road construction project that started before dawn. 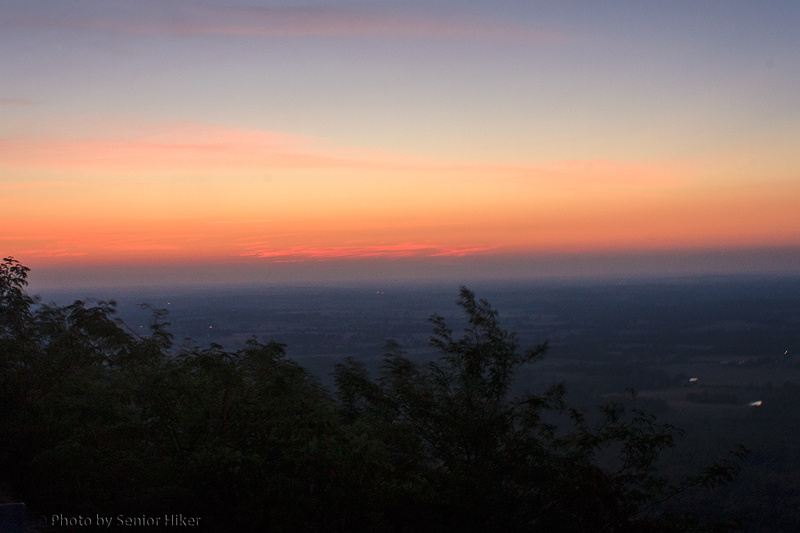 So the sky was already showing color by the time we got to the overlook (see photo above). It took a while, but after a while the sun started to put in an appearance. Later we were able to enjoy the sun in all of its golden glory. What a marvelous way to begin a day. 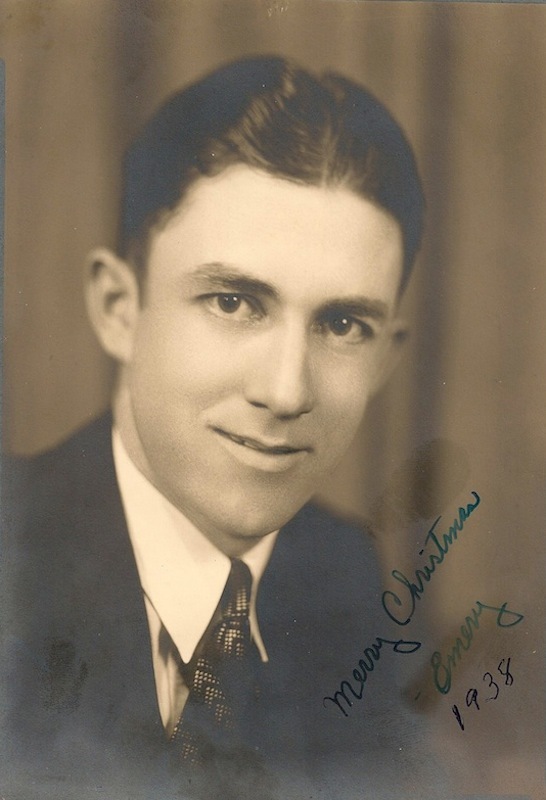 John Emery Adams, Jr. Christmas, 1938. 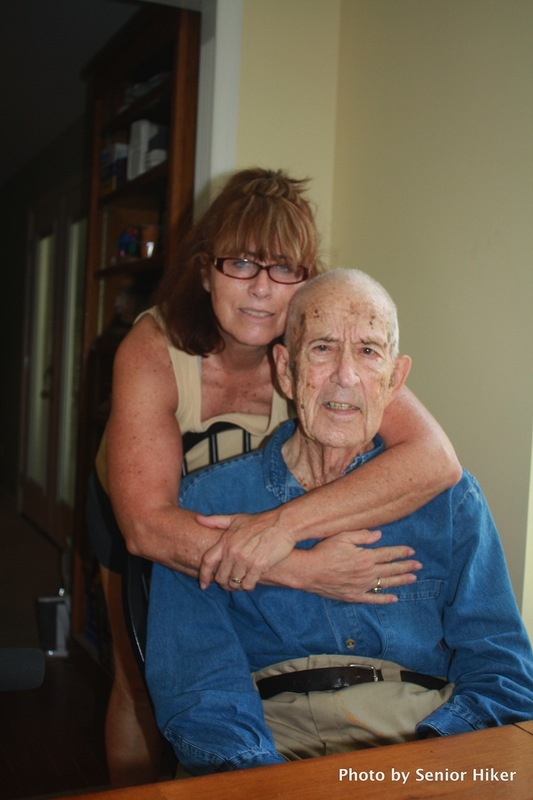 Today is a very special day — my Dad is celebrating his 100th birthday. The picture above, which he had taken for my mother when they were dating, is the earliest picture I could find. It’s hard to imagine the changes he’s seen over the past century. Dad was born in Texas, but his family moved to Arkansas when he was still a boy. He remembers going to church in a horse-drawn wagon. He was still a young teenager when he first encountered electricity. His mother fussed at him because he kept turning a light off and on trying to figure out where the light came from. 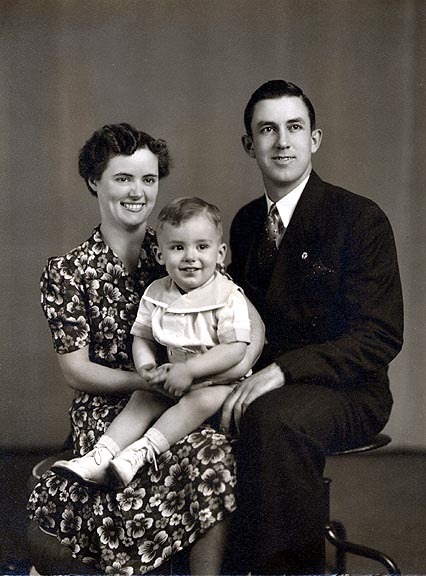 Mom, Dad and me in 1942. Dad met Mom in 1937 when he was in the CCC, but they had to wait until Mom was 20 in 1940 before they could get married. They had their first child in 1942 (it’s been a long time since I had that much hair!). Dad at Marty and Floyd’s house, Crown Point, Indiana. Approximately 1960. Dad was always interested in gadgets. 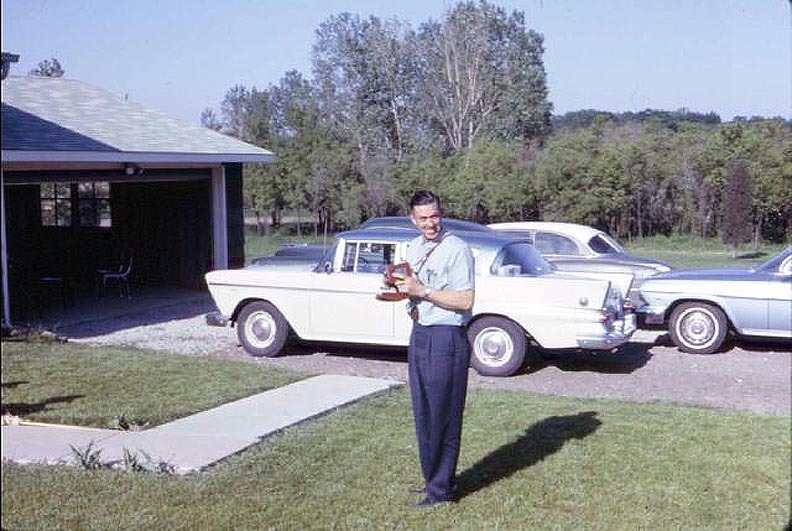 This snapshot, taken about 1960, shows him with his 8mm movie camera at my aunt and uncle’s house. Dad and Betsy at Amy and Matt’s wedding. June 16, 2001. 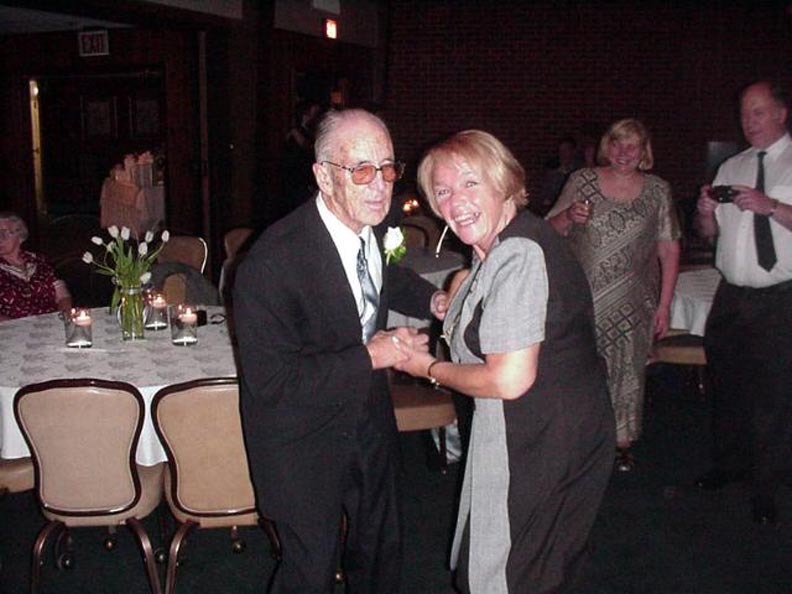 This picture shows Dad dancing with Betsy at my cousin’s wedding in 2001. They were obviously a big hit on the dance floor. Mom and Dad at Barren River State Park, Kentucky. August 29, 2004. 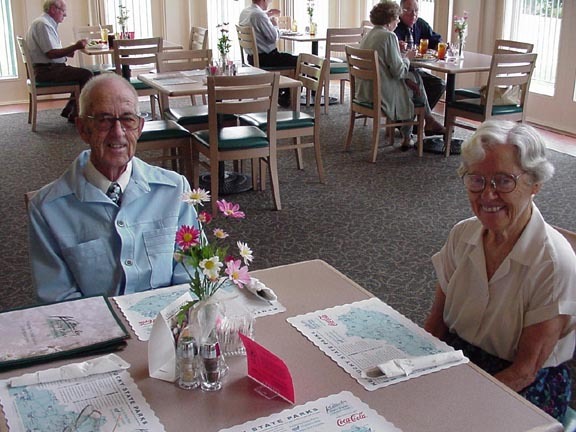 I took this picture of Mom and Dad in 2004 as we celebrated Dad’s 92nd birthday. 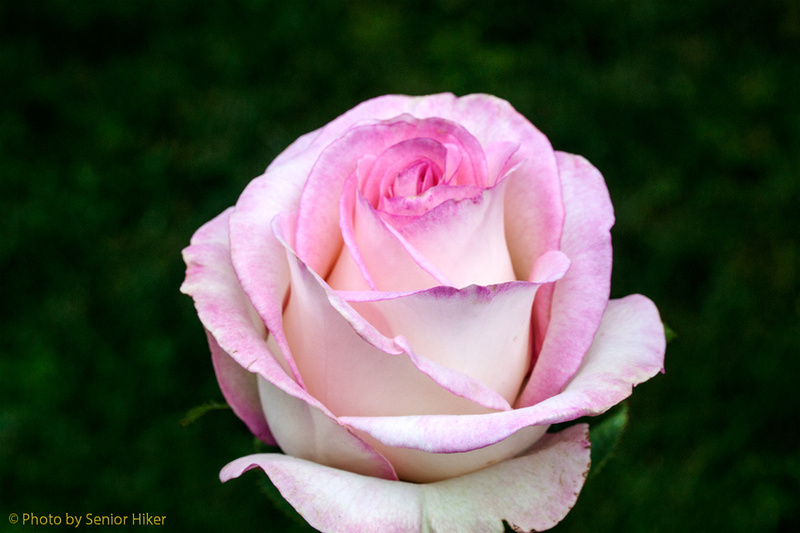 Mom died in June, 2011, shortly after their 71st wedding anniversary. Dad and his new tractor in 2006. Dad’s love of gadgets and learning things remained strong through the years. He taught himself to use a computer when he was 90. 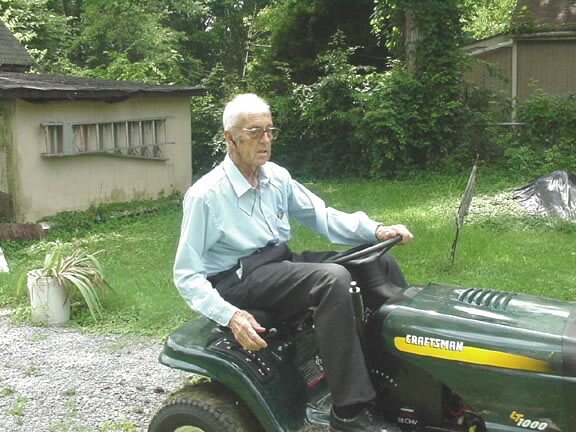 By the time he was 94 he decided he was too old to mow the lawn with his walking mower, so he got this riding tractor so he could continue mowing his own lawn. Dad and Janet, Tullahoma, Tennessee. July 4, 2012. This picture of Dad with my sister Janet is the most recent picture I have. Dad now lives with Janet in Tullahoma, Tennessee. 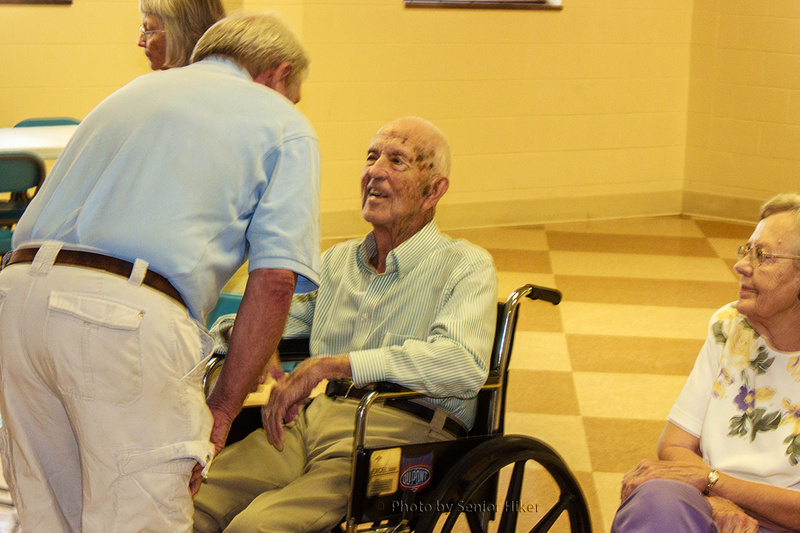 Dad conversing with a guest at his birthday celebration, Hendersonville, Tennessee. August 25, 2012. We celebrated Dad’s birthday a few days early with a reception at his church in Hendersonville, Tennessee. Quite a few friends from the church — as well as family members — came to see Dad and wish him a happy birthday. In the picture above Dad is talking with a church member he hadn’t seen in over a year. The woman on the right is his niece, who came down from Indiana with her family to see Dad. 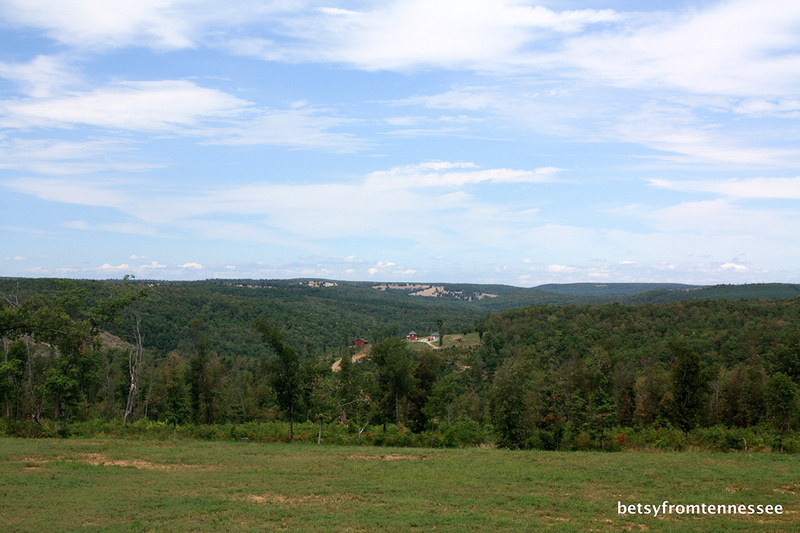 The view along Route 9 between Fairfield Bay, Arkansas and Mountain View, Arkansas. August 5, 2012. 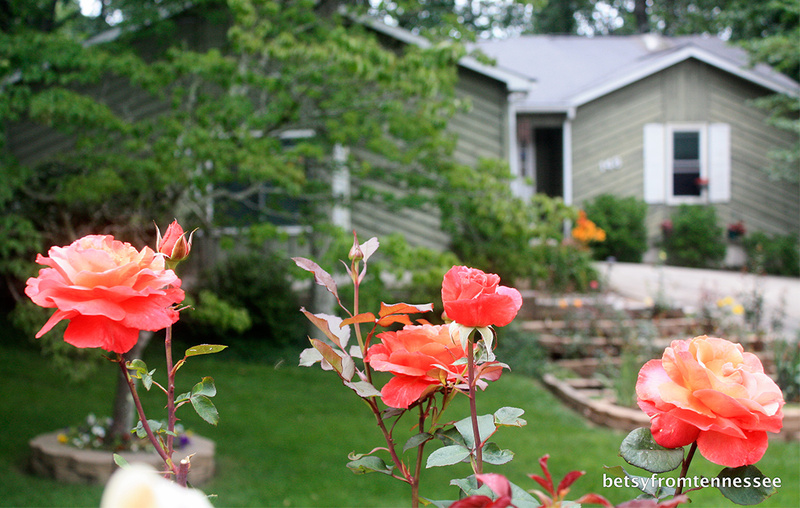 (Photo by Betsy). 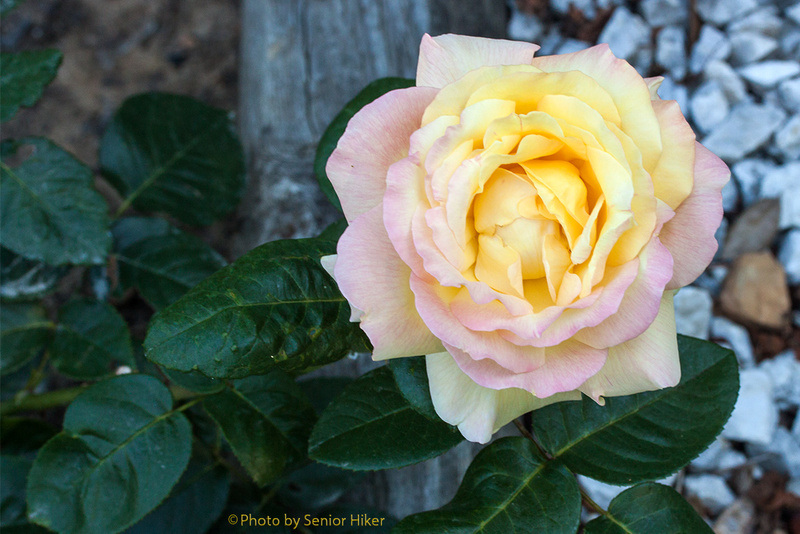 When Betsy and I went to Arkansas earlier this month, we were shocked at the drought conditions in the state. As we traveled from Memphis to Little Rock we saw many brown fields and lawns. Even when we traveled north to Fairfield Bay, it was obvious that the state was very dry. 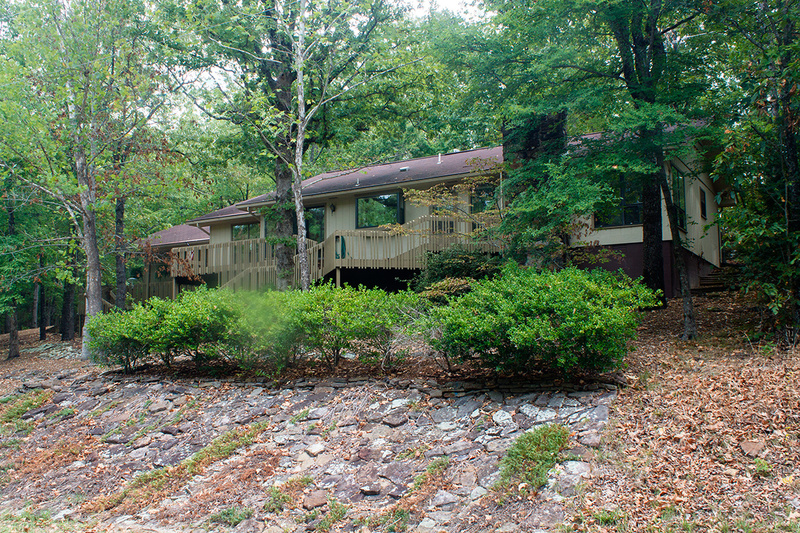 We left Fairfield Bay and headed toward Mountain View, Arkansas, along Highway 9. 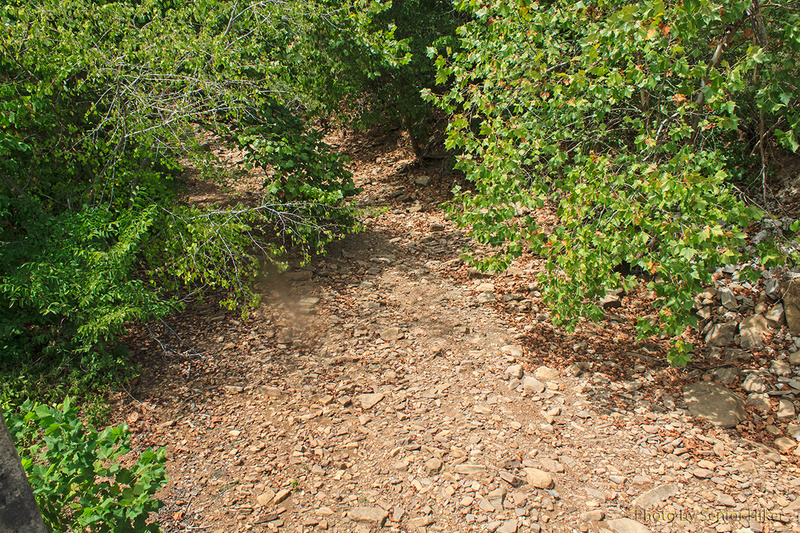 We passed over many dry creeks, but then we rounded a bend and saw the scene above. Ozark Mountains in Arkansas. August 5, 2012. It was so beautiful with the mountains, sky, clouds and green trees, that we both said “Stop!”. 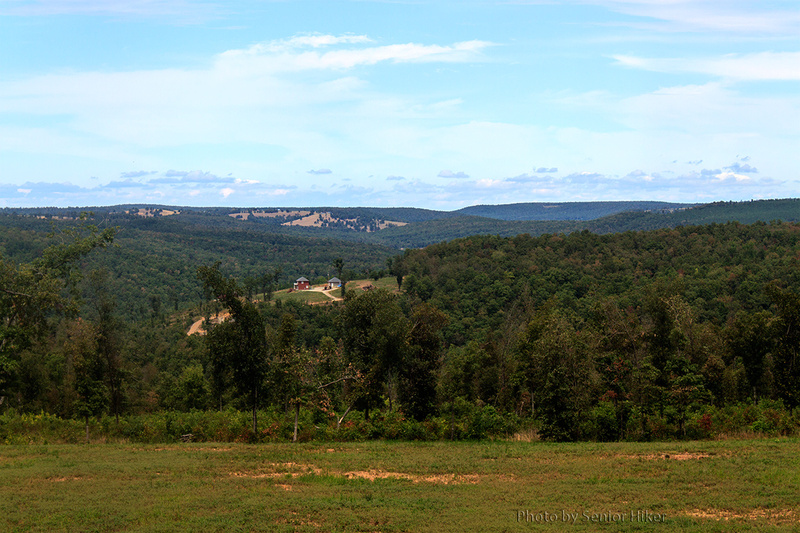 So we pulled over to the side of the road and got these pictures of this part of the Ozark Mountains. 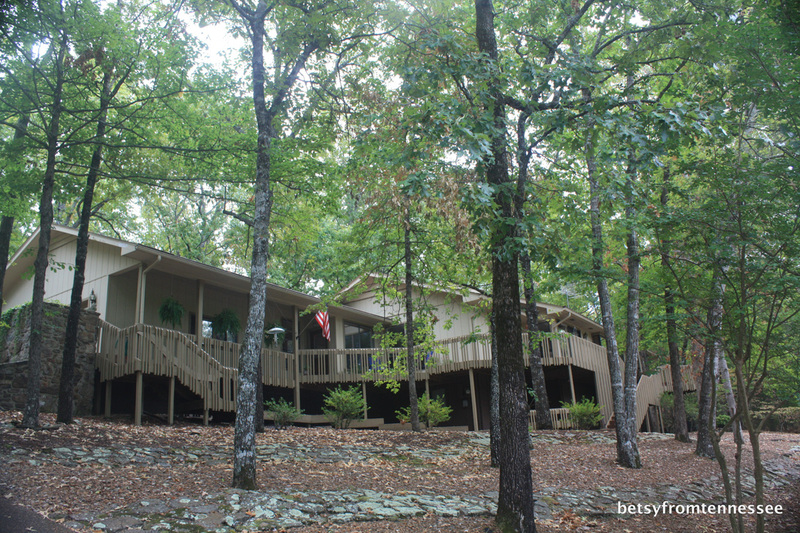 The Ozarks of Arkansas were definitely beautiful in spite of the drought. Crescent Moon over Fairfield Glade, Tennessee. August 22, 2012. 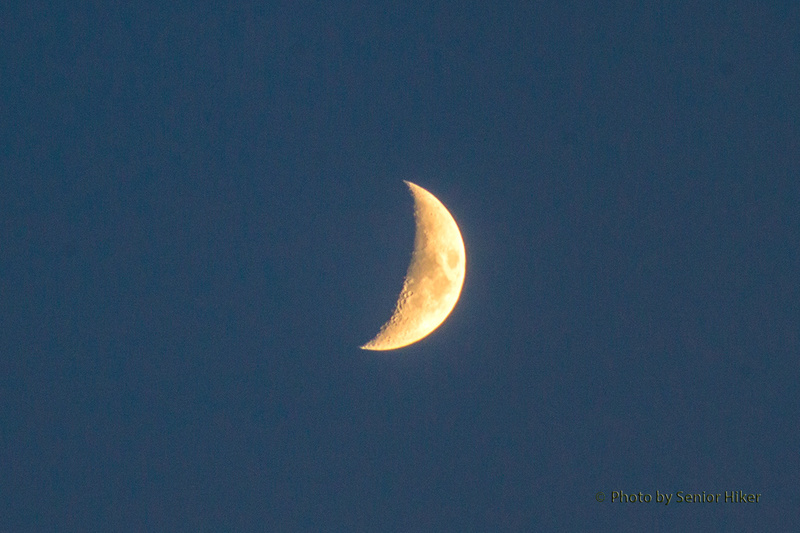 My Beautiful Bride likes crescent moons, so when she saw one early Wednesday (August 22) evening she said I should get a picture. 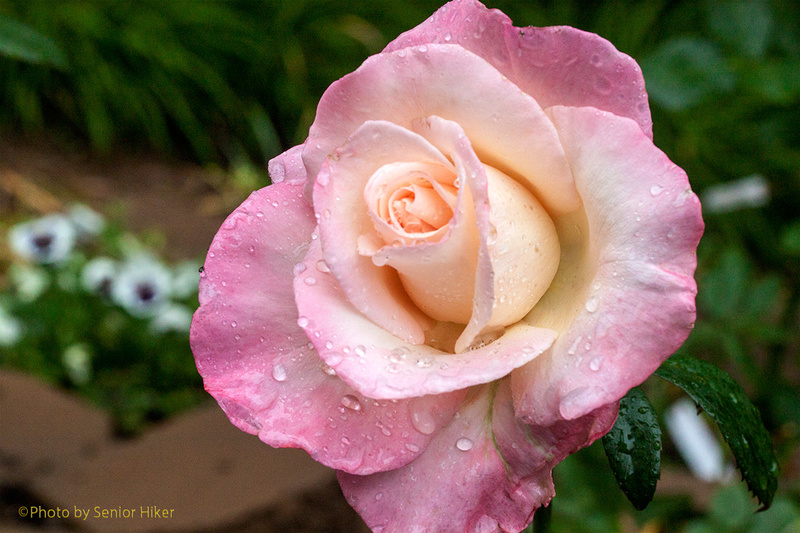 It never takes much to encourage me to get out my camera, so I went out and captured this photo. Tomahawk Creek near Mountain View, Arkansas. August 5, 2012. Don’t get me wrong — Betsy and I had a wonderful time in Arkansas as we celebrated her birthday. But I have to admit that our timing wasn’t the greatest. We enjoy ‘collecting’ waterfalls, and we planned our trip — several months ago — in order to see some waterfalls in a part of Arkansas we hadn’t visited before. But Arkansas is in the midst of a terrible drought. We thought things were dry here in eastern Tennessee, but the situation is much worse in Arkansas. We were amazed at how dry and brown the pastures and lawns appeared. Tomahawk Creek, Mountain View, Arkansas. August 5, 2012. 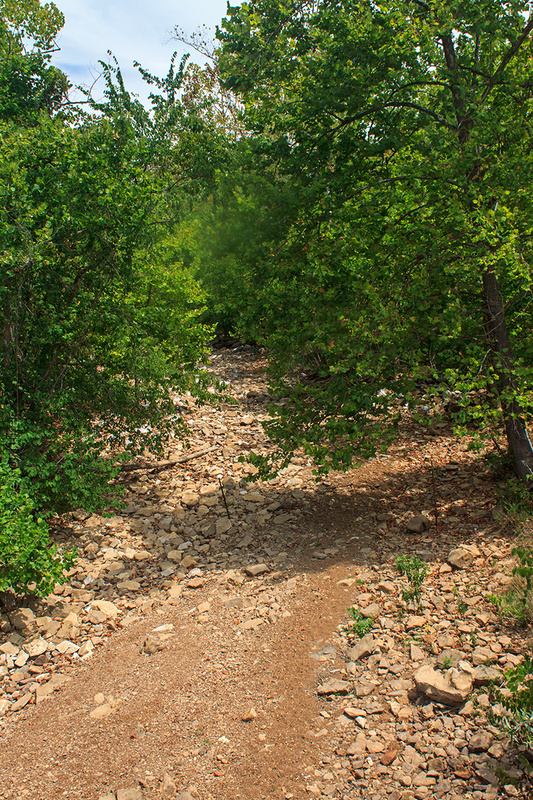 All of the rivers we saw were low, and many of the creeks were bone dry. 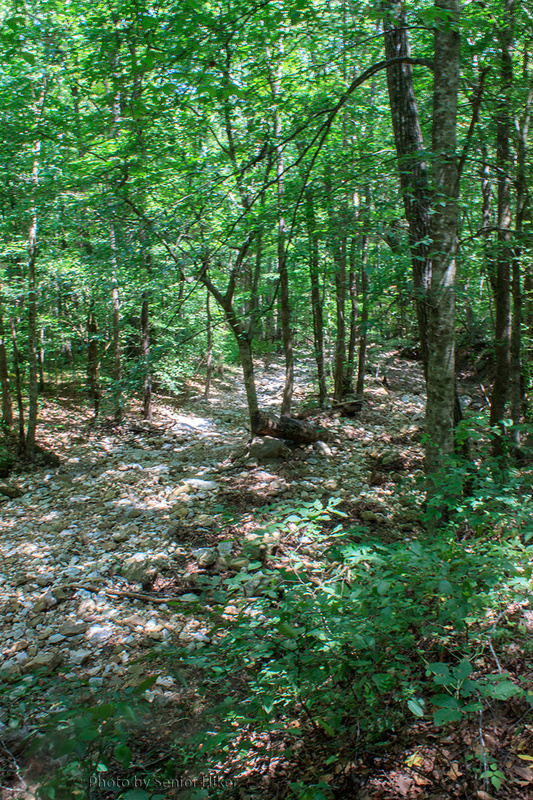 The two above pictures show Tomahawk Creek near Mountain View, Arkansas. We hiked the Lost Valley Trail of the Buffalo National River. Although there was no water in Clark Creek which paralleled the trail, we enjoyed the hike. Since there was no water in the creek, we were able to explore a natural bridge carved by the creek in greater detail than we could if water had been flowing (more about that in a later post). Clark Creek, Lost Valley Trail, Buffalo National River, Arkansas. August 6, 2012. We didn’t see the waterfalls we had hoped to see, but we did enjoy our trip very much. 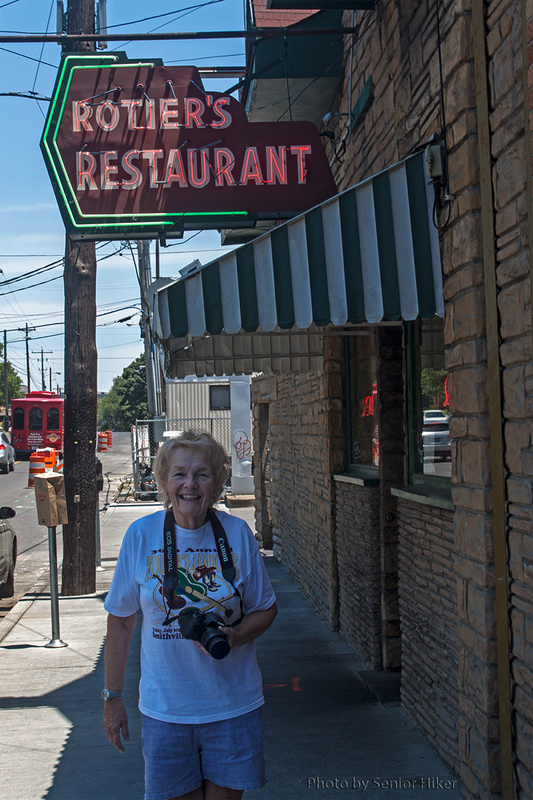 Betsy at Rotier’s Restaurant, Nashville, Tennessee. June 23, 2012. After celebrating our anniversary by walking around Centennial Park in June, Betsy and I had lunch at Rotier’s restaurant. Rotier’s is near the park, and serves some of the most delicious burgers I’ve ever had. It’s not a fancy place, but it is a local favorite and is often crowded. 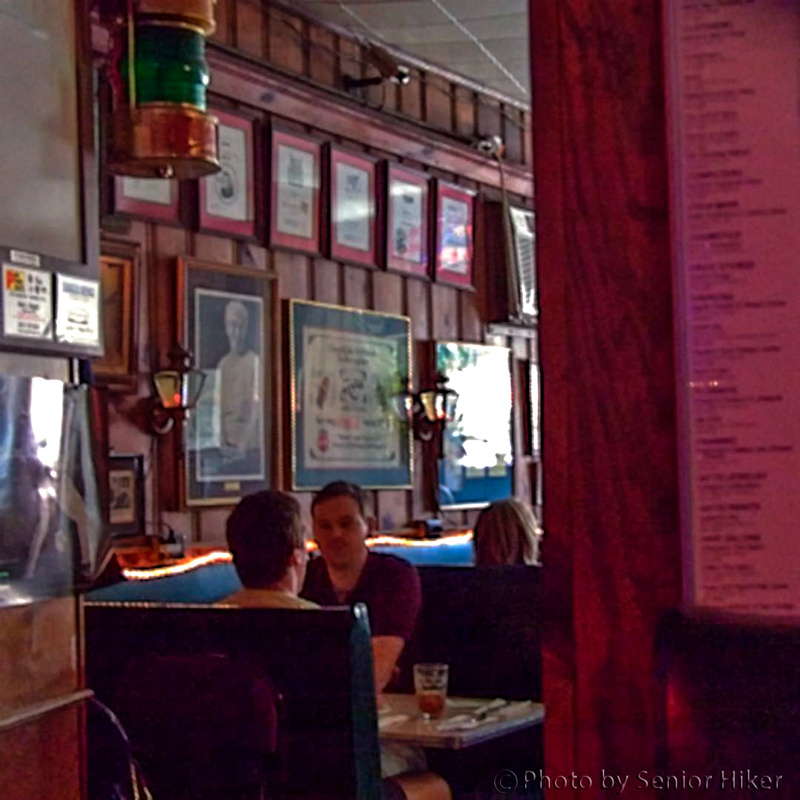 The front dining area of Rotier’s has many autographed photos on the wall. Nashville, Tennessee, June 23, 2012. We wanted to have lunch at Rotier’s because it’s a special place for us. We had lunch there on our second date back in 2001. I don’t remember what I had to eat at that time, but our visit was memorable. On that April date Betsy and I visited the interior of the Parthenon and the art museum. 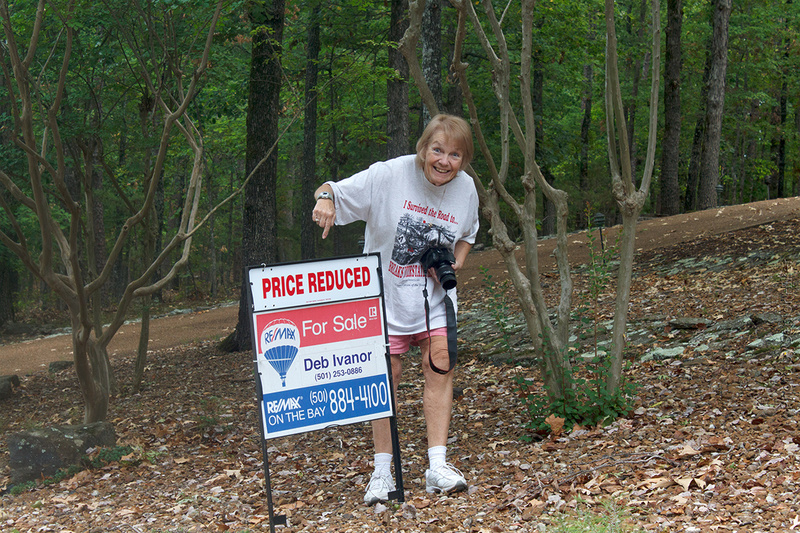 Betsy, self-sufficient woman that she is, wanted to pay for her own admission, but I pointed out that going inside was my idea and I should pay. It took some doing, but she finally agreed to let me pay for our admission. However, Betsy absolutely insisted on buying our lunch. So after leaving the Parthenon we headed to Rotier’s, which had been recommended to both of us. After a delightful lunch, Betsy pulled out her credit card and went up to the cashier to pay. She was politely informed that Rotier’s didn’t accept credit cards. My Sweet Date put her credit card away and pulled out her checkbook — Rotier’s didn’t accept checks. 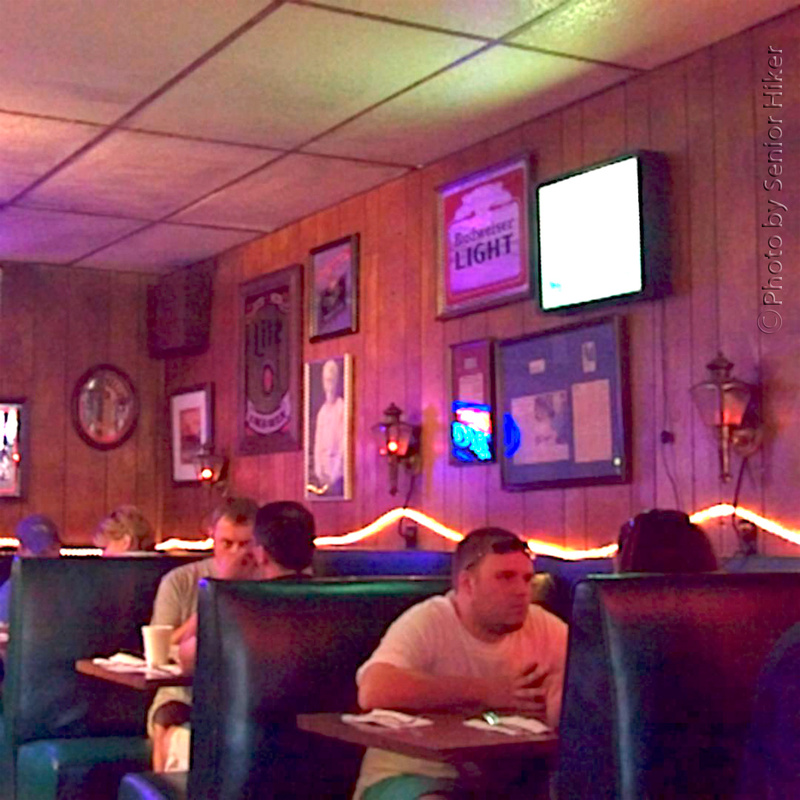 The interior of Rotier’s Restaurant, Nashville, Tennessee. June 23, 2012. By this time I was having trouble keeping a straight face. But we fortunately were able to come up with enough cash to pay for lunch. We had no problems paying for our lunch on our anniversary. Rotier’s now accepts credit cards. Scenes from a visit to the Great Wall of China in 1987. I first saw the Great Wall of China in 1987. I was in China with a group of other professors from our college on an exchange program. In some ways it’s hard to believe that so many years have passed since then, but the memories are still fresh. These are just some of the pictures I took on that memorable day. 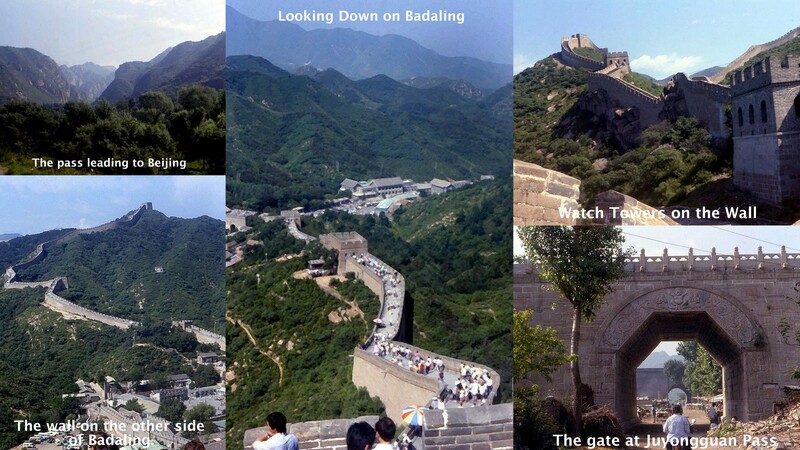 To see other pictures from the Great Wall, click HERE. Moon over Fairfield Glade, Tennessee. July 27, 2012. I must admit that I’m a sucker when it comes to seeing the moon in a blue sky. I can’t resist taking a picture (or several). 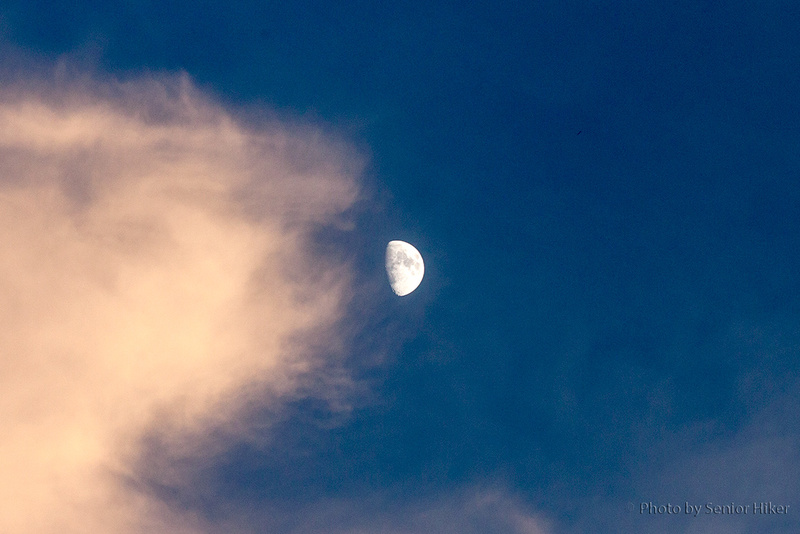 Last Friday the moon was almost overhead as the sun was setting. The clouds to the east had a pretty peach glow from the setting sun. Sometimes the clouds got in the way, but even then the scene was pretty enough that I kept snapping away. 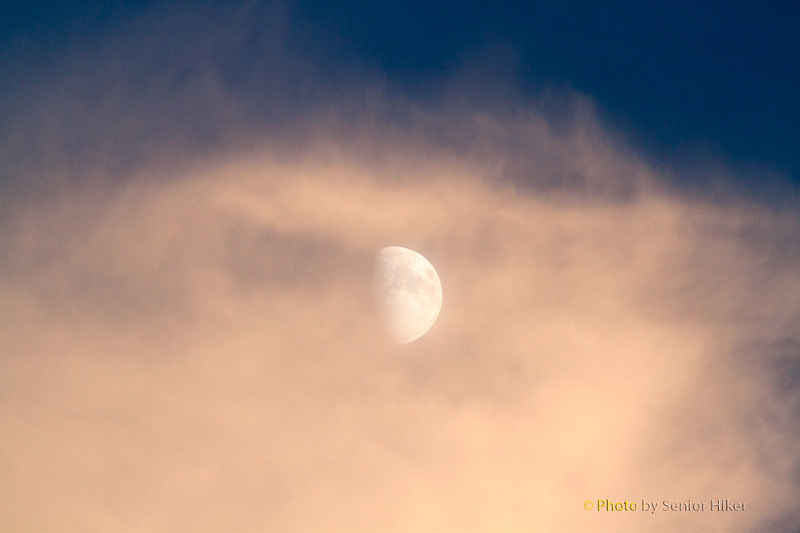 A few minutes later the clouds and sun were both gone and I concentrated on the moon itself. 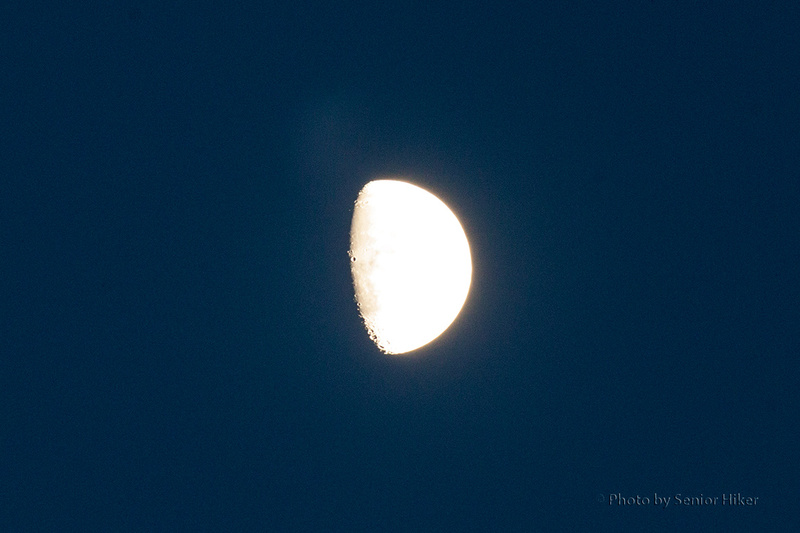 I must admit I like the craters I captured at the boundary between the dark and light sides of the moon. Betsy enjoying snow in the mountains of Virginia. She was as beautiful then as she is now. 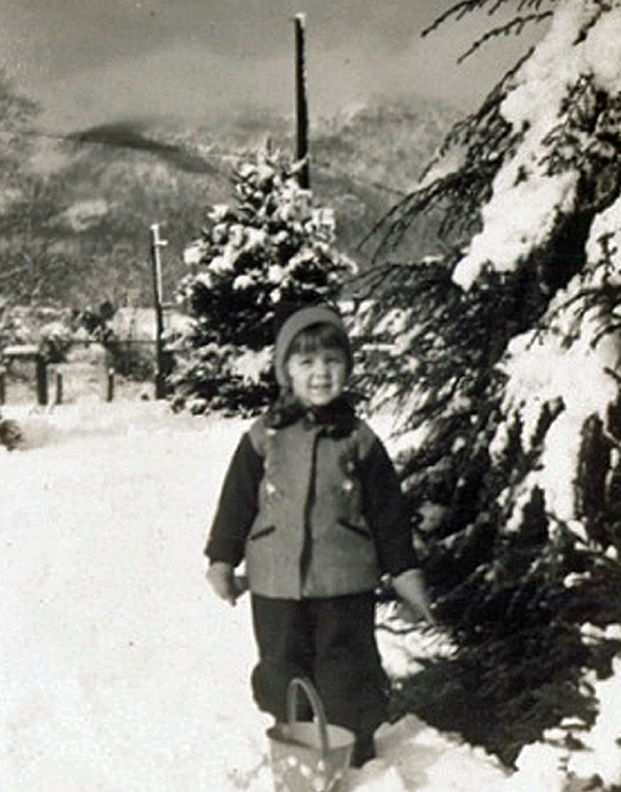 Hint #1: She still likes snow. Hint #2: She’s my Beautiful Bride. 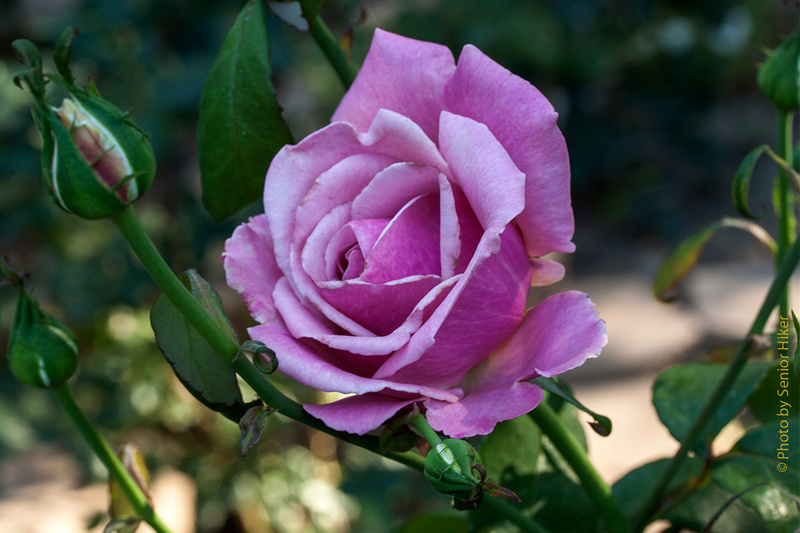 I know it would make her very happy if you would pop over to her blog, Joyful Reflections, and wish her a Happy Birthday.